Temple Grandin’s The Autistic Brain: An excerpt on the history of the autism diagnosis. The origins of the diagnosis of autism—and the parental guilt-tripping that went along with it. 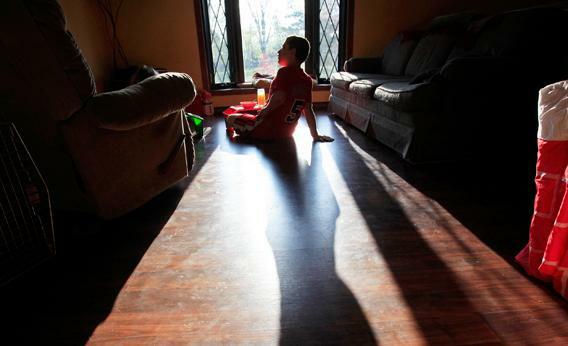 Parker Roos, who suffers from a form of autism called Fragile X, sits in the sun as he watches cartoons at his home in Canton, Ill., April 4, 2012. The following article is adapted from The Autistic Brain: Thinking Across the Spectrum, out now from Houghton Mifflin Harcourt. I was fortunate to have been born in 1947. If I had been born 10 years later, my life as a person with autism would have been a lot different. In 1947, the diagnosis of autism was only four years old. Almost nobody knew what it meant. When Mother noticed in me the symptoms that we would now label autistic—destructive behavior, inability to speak, a sensitivity to physical contact, a fixation on spinning objects, and so on—she did what made sense to her. She took me to a neurologist. Bronson Crothers had served as the director of the neurology service at Boston Children’s Hospital since its founding, in 1920. The first thing Dr. Crothers did in my case was administer an electroencephalogram, or EEG, to make sure I didn’t have petit mal epilepsy. Then he tested my hearing to make sure I wasn’t deaf. “Well, she certainly is an odd little girl,” he told Mother. Then when I began to verbalize a little, Dr. Crothers modified his evaluation: “She’s an odd little girl, but she’ll learn how to talk.” The diagnosis: brain damage. He referred us to a speech therapist who ran a small school in the basement of her house. I suppose you could say the other kids there were brain damaged too; they suffered from Down syndrome and other disorders. Even though I was not deaf, I had difficulty hearing consonants, such as the c in cup. When grownups talked fast, I heard only the vowel sounds, so I thought they had their own special language. But by speaking slowly, the speech therapist helped me to hear the hard consonant sounds, and when I said cup with a c, she praised me—which is just what a behavioral therapist would do today. At the same time, Mother hired a nanny who played constant turn-taking games with my sister and me. The nanny’s approach was also similar to what behavioral therapists use today. She made sure that every game the three of us played was a turn-taking game. During meals, I was taught table manners, and I was not allowed to twirl my fork around over my head. The only time I could revert back to autism was for one hour after lunch. The rest of the day, I had to live in a nonrocking, nontwirling world. Mother did heroic work. In fact, she discovered on her own the standard treatment that therapists use today. Therapists might disagree about the benefits of a particular aspect of this therapy versus a particular aspect of that therapy. But the core principle of every program—including the one that was used with me, Miss Reynolds’ Basement Speech-Therapy School Plus Nanny—is to engage with the kid one-on-one for hours every day, 20 to 40 hours per week. The work Mother did, however, was based on the initial diagnosis of brain damage. Just a decade later, a doctor would probably have reached a completely different diagnosis. After examining me, the doctor would have told Mother, “It’s a psychological problem—it’s all in her mind.” And then sent me to an institution. While I’ve written extensively about autism, I’ve never really written about how the diagnosis itself is reached. Unlike meningitis or lung cancer or strep throat, autism can’t be diagnosed in the laboratory—though researchers are trying to develop methods to do so. Instead, as with many psychiatric syndromes, such as depression and obsessive-compulsive disorder, autism is identified by observing and evaluating behaviors. Those observations and evaluations are subjective, and the behaviors vary from person to person. The diagnosis can be confusing, and it can be vague. It has changed over the years, and it continues to change. The diagnosis of autism dates back to 1943, when Leo Kanner, a physician at Johns Hopkins University and a pioneer in child psychiatry, proposed it in a paper. A few years earlier, he had received a letter from a worried father named Oliver Triplett Jr., a lawyer in Forest, Miss. Over the course of 33 pages, Triplett described in detail the first five years of his son Donald’s life. Donald, he wrote, didn’t show signs of wanting to be with his mother, Mary. He could be “perfectly oblivious” to everyone else around him too. He had frequent tantrums, often didn’t respond to his name, found spinning objects endlessly fascinating. Yet for all his developmental problems, Donald also exhibited unusual talents. He had memorized the 23rd Psalm (“The Lord is my shepherd …”) by the age of 2. He could recite 25 questions and answers from the Presbyterian catechism verbatim. He loved saying the letters of the alphabet backward. He had perfect pitch. Mary and Oliver brought their son from Mississippi to Baltimore to meet Kanner. Over the next few years, Kanner began to identify in other children traits similar to Donald’s. Was there a pattern? he wondered. Were these children all suffering from the same syndrome? In 1943, Kanner published a paper, “Autistic Disturbances of Affective Contact,” in the journal Nervous Child. The paper presented the case histories of 11 children who, Kanner felt, shared a set of symptoms—ones that we would today recognize as consistent with autism: the need for solitude, the need for sameness. To be alone in a world that never varied. From the start, medical professionals didn’t know what to do with autism. Was the source of these behaviors biological, or was it psychological? Were these behaviors what these children had brought into the world? Or were they what the world had instilled in them? Was autism a product of nature or nurture? One aspect of his observations, however, puzzled him. “It is not easy to evaluate the fact that all of our patients have come of highly intelligent parents. This much is certain, that there is a great deal of obsessiveness in the family background”—no doubt thinking of Oliver Triplett’s 33-page letter. “The very detailed diaries and reports and the frequent remembrance, after several years, that the children had learned to recite 25 questions and answers of the Presbyterian Catechism, to sing 37 nursery songs, or to discriminate between 18 symphonies, furnish a telling illustration of parental obsessiveness. These observations of Kanner’s are not as damning about parents as they might sound. At this early point in his study of autism, Kanner wasn’t necessarily suggesting cause and effect. He wasn’t arguing that when the parents behaved this way, they caused their children to behave that way. Instead, he was noting similarities between the parents and his patients. The parents and their child, after all, belonged to the same gene pool. The behaviors of both generations could be due to the same biological hiccup. In a 1949 follow-up paper, however, Kanner shifted his attention from the biological to the psychological. The paper was 10½ pages long; Kanner spent five and a half of those pages on the behavior of the parents. Eleven years later, in an interview in Time, he said that autistic children often were the offspring of parents “just happening to defrost enough to produce a child.” And since Kanner was the first and foremost expert on the subject of autism, his attitude shaped how the medical profession thought about the subject for at least a quarter of a century. But Kanner was also a product of his time, and his most productive years coincided with the rise of psychoanalytic thought in the United States. When Kanner looked at the effects of autism, he might have originally told himself that they were possibly biological in nature, but he nonetheless wound up seeking a psychological cause. And when he speculated on what villains might have inflicted the psychic injury, he rounded up psychoanalysis’s usual suspects: the parents (especially Mom). Kanner’s reasoning was probably complicated by the fact that the behavior of kids who are the product of poor parenting can look like the behavior of kids with autism. Autistic kids can seem rude when they’re actually just oblivious to social cues. They might throw tantrums. They won’t sit still, won’t share their toys, won’t stop interrupting adult conversations. If you’ve never studied the behaviors of children with autism, you could easily conclude that these kids’ parents are the problem, not the kids themselves. But where Kanner went horribly wrong was in his assumption that because poor parenting can lead to bad behavior, all bad behavior must therefore be the result of poor parenting. He assumed that a 3-year-old’s ability to name all the U.S. presidents and vice presidents couldn’t not be caused by outside intervention. He assumed that a child’s psychically isolated or physically destructive behavior couldn’t not be caused by parents who were emotionally distant. Kanner’s backward logic found its greatest champion in Bruno Bettelheim, the extremely influential director of the University of Chicago’s Orthogenic School for disturbed children. In 1967 he published The Empty Fortress: Infantile Autism and the Birth of the Self, a book that popularized Kanner’s notion of the refrigerator mother. Like Kanner, Bettelheim thought that autism was probably biological in nature. And like Kanner, his thinking on autism was nonetheless grounded in psychoanalytic principles. Bettelheim argued that an autistic child was not biologically predetermined to manifest the symptoms. Instead, the child was biologically predisposed toward those symptoms. The autism was latent—until poor parenting came along and breathed life into it. If Mother hadn’t taken me to a neurologist, she might eventually have been vulnerable to the refrigerator-mother guilt trip. She was only 19 when I was born, and I was her first child. Like many young first-time mothers who find themselves confronting a child’s “bad” behavior, Mother initially assumed she must be doing something wrong. Dr. Crothers, however, relieved that anxiety. When I was in second or third grade, Mother did get the full Kanner treatment from a doctor who informed her that the cause of my behavior was a psychic injury and that until I could identify it, I was doomed to inhabit my own little world of isolation. But the problem wasn’t a psychic injury, and Mother knew it. The psychoanalytic approach to a disorder was to find the cause of a behavior and try to remove it. Mother assumed she couldn’t do anything about the cause of my behavior, so her approach was to concentrate on dealing with the behavior itself. In this respect, Mother was ahead of her time. It would take child psychiatry decades to catch up with her. Excerpted from The Autistic Brain: Thinking Across the Spectrum by Temple Grandin. Copyright © 2013 by Temple Grandin and Richard Panek. Reprinted by permission of Houghton Mifflin Harcourt Publishing Company. All rights reserved.